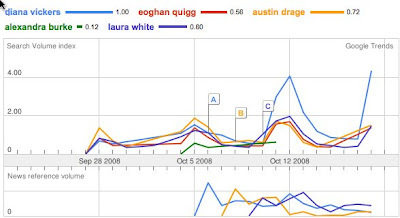 Here are todays Google analytic graphs. The top one is the more complex Google Insight results. The second is the basic Google Trends. The results are obvious regarding Diana. However, Alexandra should be worried. She just isn't connecting with masses despite being given songs that play to her strengths.